In 2016, enough opioids were prescribed to provide every American with 36 pills. In Alabama, the rate was 72 pills per person, which was the highest in the nation. 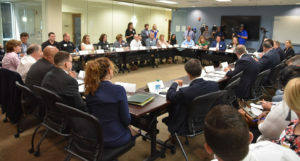 While the opioid epidemic is wreaking havoc across the U.S., dozens of concerned representatives from statewide organizations and local Health Action Partnerships gathered at United Way of Central Alabama earlier this month for a roundtable discussion on opioids and their impact on Alabama communities. Hosted by U.S. Senator Doug Jones on an information-gathering mission, the discussion included individuals and groups who are on the front lines of the crisis. Medical professionals, substance-abuse treatment and prevention experts, paramedics, law enforcement officials and personal advocates all chimed in and provided valuable, eye-opening input. 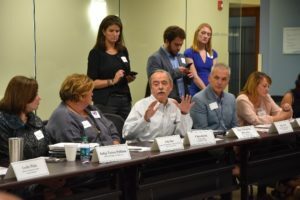 Group members expressed a need for better data-sharing among healthcare providers, state agencies and addiction-treatment facilities in order to better understand the scope of the crisis and where to direct resources. Participants also discussed the need to provide more preventive services through education to students, teachers and parents, as well as proactively identifying and addressing mental health and behavioral issues in children, which can often be precursors to substance abuse. Regardless of their specific roles, roundtable participants agreed that increased collaboration across sectors was critical to preventing opioid dependency and overdoses that claimed the lives of 343 Alabamians in 2016. The magnitude of the crisis can seem overwhelming. But work is underway locally to address the issue at the individual level. Recognizing that the substance-abuse treatment system can be confusing and intimidating, organizations including the Jefferson County Department of Health, Crisis Center, Fellowship House and Cooper Green Mercy Health Services created the Recovery Resource Center in 2017. The collaborative initiative is dedicated to simplifying the treatment process and providing a central point contact for people seeking help for themselves or someone they love. In addition to general information about addiction and recovery, the Recovery Resource Center provides clients with assessments to identify the appropriate level of care, and referrals to meet the individual’s treatment needs. Through continued cooperation and growing partnerships, communities across Central Alabama are fighting back against the opioid epidemic and providing hope for individuals and families. Members of the Bold Goals Coalition will be instrumental in this vital collaborative effort to reverse the course of one of the biggest single problems we face.